What if I am left on my own? What can I do at a funeral? What are the boundaries when it comes to what I can do? Where do I found resources for prayer and prayers? What do I do if I dry up? What if I lose my place? Does the rector have to do everything? How do I relate all this to my own spiritual life and life of prayer? Our basic resource and workbook for this workshop is The Book of Common Prayer (The Church of Ireland, 2004). Morning Prayer and Evening Prayer (see the Book of Common Prayer (2004), pp 83-116) are the daily offices of the Church. They derive from the monastic offices, especially the cycle of daily prayer in the Benedictine tradition, and were adapted by Cranmer and the Anglican reformers and their successors, bringing daily prayer out of the cloisters and into the daily life of parishes in the villages, towns and cities. It was their intention not that these offices should be the main Sunday service in our parishes, but that they should be said daily throughout the year (see The Book of Common Prayer 2004, p 84). As prayer designed for the whole church, for the whole people, it is appropriate that it should be led by lay people. Historically, it is worth recalling that most of the monks in a Benedictine monastery were not priests. There are some parts of the service that are reserved for ordained priests – namely, pronouncing the words of absolution (see pp 86, 102 ) and the blessing (see p 116). But there is no provision for a blessing in the original form, (see p 100), and in the new format a blessing is only an option (see p 116). How familiar are you with Morning Prayer and Evening Prayer? Are these offices used daily in your parishes, as The Book of Common Prayer expects? How is Morning Prayer used in your parish as the principal service on Sundays? How do you set the tone of the day? Become familiar with the options, and notice the different places where the Psalm is used in Morning Prayer and Evening Prayer. How do you find the Psalms, the Readings and the Collects? Are you familiar with how the Canticles are chosen? Are you aware of the hymn versions of the Canticles in the Irish Church Hymnal? How do you write intercessions? Are their parts of Morning Prayer and Evening Prayer you should memorise? Are you familiar with the shortened forms of Daily Prayer for Weekdays (see pp 136-137), the simple structure for Daily Prayer (p 138) and the Weekday intercessions for Monday to Saturday (pp 139-144)? Have you ever drawn on the resources headed “Some Prayers and Thanksgivings” (pp 145-153)? The one service that many of you are being asked to lead is the Service of the Word (p 165, followed by notes running to three pages, pp 166-168). At first, this looks like one of the simplest services to organise. But it is probably the most difficult. Too often, we merely adapt the shape to the way we have always organised Morning Prayer or Evening Prayer, which defeats the purpose of introducing this service. Too often we take the outline (p 165) as a rigid structure, rather than as scaffolding, and then wonder why the edifice crumbles around us. Too often we start off with the best of intentions, but fail to take heed of the advice and guidance offered in those three pages of notes. Too often we want you a new service, a new approach to worship, but fail to do anything about the setting, including the seating and the part of the church we use. Too often, we fail to see it as a Service of the Word, and give more emphasis to other sections than the Word itself. Too often, we fail to set the tone, to think about why we are using this service rather than any other, and then wonder why it does not work, why it falls flat, or why it becomes stale through constant use in the same old familiar way. In your parish, who structures a Service of the Word ... the rector, the person leading it, a group of people? It is totally appropriate, for example, in a parish where a Service of the Word is fall-back option every time there is a fifth Sunday in the month, for someone in lay ministry to take responsibility for organising that service, even though they do not have to lead it. You could theme those Services of the Word: not just around children, which is the normal fall-back position, but: around the elderly; around the beatitudes, affirming those who live out the Beatitudes in your parish, who make peace, who mourn, who hunger and thirst for righteousness, who demand mercy, &c; focus on unemployment or the current financial, economic and political crisis in our country; Lent or Advent; the five points of mission in the Anglican Communion; and so on. Let us look at the notes on pp 166-168 and see what they say about what we can do? Are there other ways to adapt and use this service? Bishop Harold Miller, for example, suggests it can be used as the Liturgy of the Word before the Liturgy of the Sacrament at the Holy Communion or the Eucharist. Other, short services you may consider using include Compline (pp 154-161), A Late Evening Office (pp 162-164) and the Litany (pp 170-178). Could we discuss appropriate venues and appropriate occasions for using some of these services? ● A prayer session with the Mothers’ Union after a speaker has failed to turn up. Let me say a word about having everything prepared beforehand and having everything in one file rather than a pile of books scattered around your feet and at the base of the prayer desk. What image does this create for people trying to catch a glimpse of the holy? Can you imagine how easy it is to forget which colour ribbon you used to mark a particular page or reading? In most of our parishes, the rector usually does almost everything at the Eucharist. The choir may lead the signing, there may be a rota for the readings and for the intercessions – although they too are often written for people by the rector – and the churchwardens present the collection. But the rector does not have to do everything. On the contrary, the people should be doing almost everything. Indeed, the word liturgy means the work of the people: the work comes from the Greek λειτουργία or λῃτουργία, which in turn comes from the Greek words λαός (the people) and ἔργο (to do or to work). Why does the priest as the President at the liturgy, so often do all the work of the people? What does the President do at the Eucharist? But the liturgical greeting also establishes the dialogue, between God and the people, and between the president at the liturgy and the people, it establishes the horizontal dimension to our worship and our liturgy. ● Oversee what is happening. But this leaves plenty of scope, plenty of room for others to participate. And not just to play bit parts but to show that we are co-celebrants (not concelebrants), and the Liturgy is truly the work of the people. For example, the Old Testament and Epistle readings ought to be read by lay people, the intercessions are supposed to be the prayers of the people, the offering is supposed to be the offering of the people. Why, so often, do the clergy insist on assuming all these roles? The readings may be the only message people hear on a Sunday morning. And so reading them is an important, vital ministry of the laity. It is not good enough to be handed them on a scrap of paper five minutes before we begin on a Sunday morning. How would your parish organist react to receiving the hymn numbers a few minutes beforehand? You need time to think, time to rehearse, time to read out loud, time to cope with difficult pronunciations and to get a feeling for emphases, time to reflect and pray. If you do not know what the reading is about, how can those present hear what it is about? Or the people leading the intercessions? Who listens to the prayers the people want to pray and need to pray? When it comes to the Offertory, the offering is not about the collection of money being brought up to the rector for a blessing. 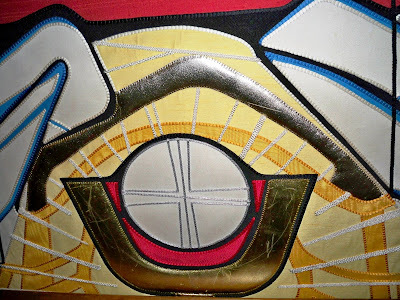 The Offertory first and foremost symbolises that we, the people, offer ourselves, our bodies, our lives, our whole being, to God, as a royal sacrifice. Bread and wine symbolise this in a very profound way. They are gifts of food and drink that God has given us, but only become food and drink because of the work of human hands. What God offers to us, we now offer to God, and in return God becomes present among in Christ, in word and sacrament. The bread and wine ought to be placed on the altar, already prepared, before the Liturgy begins. The altar could be prepared at the offertory by lay people, even children, especially children. The gifts ought to be brought up by lay people, from among the body of the people. That is an authentic and visible sacramental expression of lay ministry. Do the gifts have to be restricted to bread and wine alone? The gifts of God for the people of God! When it comes to the distribution of the sacrament, it may be very appropriate for the presiding priest to (a) be ministered to by someone else and/or (b) sit in the president’s chair. After the blessing, it is once again appropriate for a lay person who has been involved in the ministry at the liturgy to pronounce the dismissal. How much preparation do you need for this aspects to or dimensions of lay ministry in the Liturgy? How much can you take part in? Other services, including Baptisms, Confirmations, Marriages, Funerals. But I think that is too dismissive, and too unfair to people who seldom come to church except on these occasions. These are moments of crisis for these people, sacred moments for God, and, moments of mission for the Church. Always remember, never forget, that people will always remember and never forget when you behave inappropriately, lazily or without preparation on these occasions. If you do it right, they may never remember what you say or do, just simply that you were there. But get it wrong, and they will remember for ever. And so, on these occasions, make sure you are prepared, over and over again. You may get plenty of time to prepare a couple for a baptism of their child or for their marriage. Unlike having perhaps a week or two, maybe more, to prepare for a parish service or a sermon, you may have no time at all to prepare for the death of a parishioner. You may get no time at all to prepare for a funeral. So, always have the preparation in mind if these are tasks being committed to you in your parish. Be mentally prepared in your memory – down to the point of remembering how to dress properly. You may have to prepare a couple for the baptism of their child, or for their marriage. You will be surprised the relationships you come across. You will have to put aside your personal views about single parenthood, remarriage after divorce, and your propensity to rush to judgment not only about the people who are being buried, but the family circumstances of those who mourn. It is for good reason that these are called pastoral offices. You may have to take responsibility for receiving a coffin into your parish church on the evening before a funeral, or for doing a committal at a graveside or in a crematorium. Hopefully you will be involved in assisting at many, many baptisms. But they are not always cute and comfortable occasions. There are baptisms of adults, there are baptisms of children with real medical problems that are causing true anxiety for the parents. There are difficult relationships that cause problems at baptisms ... and at marriages and at funerals too. Hospital visits may also be your responsibility. Consider then that you may be asked to be, you may want to be, involved in the consequent baptism, marriage or funeral. ● Baptisms: p 345 ff (especially p 357 ff). ● Confirmation, p 382 ff. ● Renewal of Baptismal vows, p 398 ff. ● Marriage (especially pp. 416 ff). ● Ministry to those who are sick (pp 440 ff; Anointing with Oil, pp 448-449; Prayers, pp 450-453; preparation for death, pp 454-456; A celebration of wholeness and healing, pp 457-464). ● Funeral Services (pp 466 ff, especially pp 480 ff; see the notes on p 480; A Form for the Burial of Ashes after Cremation, p 501; The Funeral Service for a Child, p 504; Prayers, p 510; and a Form of use in the Home, Funeral Home or Mortuary, p 514). Raymond Chapman, Hear Our Prayer: Gospel-based intercession for Sundays, Holy Days and Festivals, Years A, B, & C (Norwich: Canterbury Press, 2003). Frank Colquhoun (ed), Parish Prayers (London: Hodder and Stoughton, 2005 ed). Frank Colquhoun (ed), Contemporary Parish Prayers (London: Hodder and Stoughton, 2005 ed). Frank Colquhoun (ed), New Parish Prayers (London: Hodder and Stoughton, 2005 ed). Common Worship: Times and Seasons (London: Church House Publishing, 2006). Dorothy McRae-McMahon, Liturgies for Daily Life (London: SPCK, 2004). Dorothy McRae-McMahon, Liturgies for High Days (London: SPCK, 2006). Brian Mayne (ed), Celebrating the Word: Complete Services of the Word for use with Common Worship and the Church of Ireland Book of Common Prayer (Norwich: Canterbury Press, 2004). Harold Miller, The Desire of our Soul (Dublin: Columba, 2004). Janet Morley, All Desires Known (London: SPCK, 1988/1992). Janet Morley (ed), Bread for Tomorrow, Praying with the world’s poor (London: SPCK/Christian Aid, 1992). Opening Prayers: Scripture-related collects for Years A, B and C from the Sacramentary (Norwich: Canterbury Press, 1992). Lisa Withrow, Occasions of Prayers (London: SPCK, 1999). (Revd Canon Professor) Patrick Comerford is Lecturer in Anglicanism, Liturgy and Church History, the Church of Ireland Theological Institute. These notes were used at practical workshop with students attending the Reader Course Day Conference on 10 October 2015. The Anglican Communion is a communion of churches spread across all the inhabited continents, bound together through a number of instruments. ● The Lambeth Conference, first called in 1867 and now meeting every 10 years – the last meeting was in Canterbury in 2008. Is there going to be another one in 2018? ● The Anglican Consultative Council, formed in 1968. Its last meeting, ACC-15, was in Christchurch, New Zealand, from 27 October to 7 November 2012. ACC16 is planned for May 2016 in Malawi. The Church of Ireland members are the Revd Dr Maurice Elliott (Director of the Church of Ireland Theological Institute) and Mr Wilfred Baker (Cork). ● The Primates’ Meeting, which takes place every two or three years. The last four meetings were in Dromantine, near Newry (2006), Dar es Salaam, Tanzania (February 2007), Alexandria, Egypt (February 2009), and the Emmaus Retreat Centre in Swords, Co Dublin (January 2011). The next meeting has been called for Canterbury in January 2016. ● The Standing Committee of the Anglican Consultative Council, increasingly being referred to as the Standing Committee of the Anglican Communion. This is a 14-member group (15, if the Archbishop of Canterbury is present). Seven members are elected by the ACC; five are members of the Primates’ Standing Committee; and the elected Chair and Vice-Chair of the ACC. Its defined function is to assist the Churches of the Anglican Communion in advancing the work of their mission worldwide. ● The Secretary-General of the Anglican Communion, who since last September has been the Most Revd Dr Josiah Idowu-Fearon, former Bishop of Kaduna in the Church of Nigeria. He succeeded Canon Ken Kearon from the Church of Ireland, now Bishop Kenneth Kearon of Limerick and Killaloe. ● The mission agencies, although they have no instrument of unity that holds them together. The debates aimed at dealing with diversity and tension within the Anglican Communion and on the Anglican Covenant now include discussions about the instruments of communion or unity and the discipline needed to hold together the Anglican Communion and to deal with any breaches of the Covenant should it ever be fully ratified. Of course, there are major questions about the continuing place within the Anglican Communion of those provinces or dioceses that fail to, or refuse to, sign up for the covenant. The Anglican Communion, which describes itself as the Anglican/Episcopal family, consists of about 80 million Christians who are members of 44 different churches. It is the third largest communion or international denomination of Christians, following Roman Catholics and the Eastern Orthodox Churches. The Anglican Communion is made up of 34 provinces, four United Churches, and six other churches, spread across the globe. These include four churches in the Indian sub-continent in which Anglicans merged with other denominations to form new, united churches (Bangladesh, North India, Pakistan and South India). There are four national churches (Spain, Portugal, Sri Lanka and Bermuda), that are still so small that they, along with the small Anglican presence on the Falkland Islands, accept the Archbishop of Canterbury as their Metropolitan. Ten Anglican churches in the Caribbean, Central and Latin America have special links to the Episcopal Church in the US (TEC). For example, numerically speaking, the Diocese of Haiti is the largest diocese in TEC. The newest Anglican province is the Hong Kong Sheng Kung Hui Hong Kong and Macao, with three dioceses (Hong Kong Island, Eastern Kowloon, Western Kowloon), and one missionary area (Macao). Many of the dioceses in these churches are small compared with the dioceses of the Church of Ireland. Others are vast: the Diocese in Europe alone, which is part of the Church of England, stretches from Morocco in North Africa to Vladivostok in Siberian East Asia. ● The Convocation of American Churches in Europe, which is part of TEC and has its own bishop, has a cathedral in Paris and churches and missions in Belgium, France, Germany, Italy, Switzerland. ● The Lusitanian Church (Portugal). 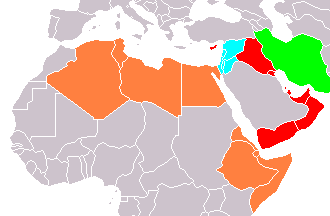 The Episcopal Church in Jerusalem and the Middle East is spread across three continents, from Libya in North Africa, to Cyprus in the Mediterranean, to the Gulf States and Iran, to Ethiopia in the Horn of Africa. A variety of languages is in use throughout the churches of the Anglican Communion, both in the liturgy and in the common, spoken language of the people. At meetings of the Parochial Church Council in the Church of the Resurrection in Bucharest, I have heard prayers in both English and Romanian, the walls of the church are decorated with icons with inscriptions in English, Greek, Romanian and Church Slavonic. 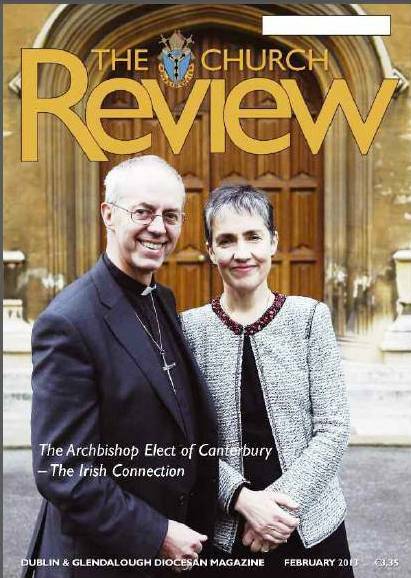 Until April this year, the chaplain was the Revd Patrick Irwin, from a well-known Irish clerical missionary family. ● A mixture of Arabic and English in Sudan, Egypt and throughout the Middle East. ● A variety of languages in the Episcopal Church in Jerusalem and the Middle East, including Greek, Turkish, French, Arabic, Ethiopic, and languages from the Indian sub-continent and the Philippines. ● There are Anglican dioceses where the first language of the liturgy and language used in synods and church administration are Chinese, Japanese, Korean, Swahili, &c. Indeed, English is a minority language in the Anglican Communion. Mark Chapman says that in the days of the British Empire there was an obvious connection between Anglicanism and England … But while many of the member churches in the Anglican Communion claim a direct link with the Church of England, and see this as an important element in what defines them as Anglican, it is not always so, and has not always been so. ● The Church in Wales. These four churches have distinctively different origins. The Church of Ireland, the Church in Wales and the Scottish Episcopal Church point out that the origins of Christianity in their countries predate the mission in England of Saint Augustine of Canterbury, who was sent from Rome in the year 597. The Church of Ireland claims to be the successor to the ancient Celtic and Anglo-Norman churches. In the late mediaeval period, the churches in the dioceses in the ancient Viking cities of Ireland, including Dublin, Waterford, Cork and Limerick, sometimes continued to look to Canterbury for their episcopal orders and succession. The reformation in Scotland was followed by turmoil over whether the reformed church should be episcopal or Presbyterian in its style of church government. After the Episcopal Church was disestablished in 1689, it suffered under penal laws in force from 1746-1792. This church developed its own (high) liturgy; it had strong links with the dissenting, high church Nonjurors of the Church of England, and did not adopt the 39 Articles until the end of the 18th century. Historically, there have been strong links not only between the Church of Ireland and the Church of England, but there have also been strong links between the Church of Ireland and the Scottish Episcopal Church. At the restoration of Charles II, and the restoration of the episcopal model of church in the Church of Ireland in 1660, four of the eight remaining bishops of the Church of Ireland were of Scottish birth, or of immediate Scottish ancestry. Later, when it came to framing its own Ecclesiastical Canons, the Episcopal Church of Scotland looked not only to the 1603 Canons of the Church of England, and the 1636 Canons of the Church of Scotland, but also to the 1634 Canons of the Church of Ireland. Just as it would be wrong to define the distinctive characteristics of the Church of Ireland or the Scottish Episcopal Church within the strictures of our links with the Church of England – in so far as it is missing a lot of the subtleties and salient facts – so too the Anglican Churches around the world cannot be defined as Anglican solely because of their links, directly or indirectly, to the Church of England. Some of those churches trace their episcopal succession, their liturgies, their ways of doing theology, their stories, to the Episcopal Church of Scotland, including the Episcopal Church in the US (TEC), which in turn introduced Anglicanism to many parts of Latin America, to Korea, to Japan and to many parts of China. South Africa: The first Anglican celebration of the Holy Communion in South Africa was by a priest of the Church of Ireland, and church historians see this event as marking the origins of the present-day Anglican Church of Southern Africa (ACNA). Many other Anglican churches, including those in Kenya, Uganda, Sudan, owe their growth and present numbers to Irish missionaries. Irish missionaries were pioneers in establishing an Anglican presence in parts of Persia/Iran, India, China, &c.
Mexico: The Anglican Church of Mexico originated indigenously in 1810, and sought orders from the Episcopal Church in the US. Spain: The Spanish Reformed Episcopal Church arose through the work of a former Roman Catholic priest. At first, it was under the pastoral care of the Bishop of Mexico, but it received its episcopal orders from the Bishop of Meath in 1894, and was not fully integrated into the Anglican Communion until 1980. Is it Anglican? Is it indigenous? Is it a daughter church of the Church of Ireland? Portugal: the Lusitanian Church (the Portuguese Episcopal Church) was formed by dissident Roman Catholic priests who formed congregations and adapted the 1662 Book of Common Prayer. India: The Mar Thoma Syrian Church of Malabar in India, although not a full member of the Anglican Communion, is in full communion with all the member churches, and sends its bishops to the Lambeth Conferences. Yet its origins are to be found in the Syrian Orthodox Church in India. These churches in the Anglican Communion display diversity in language, culture, origins, and ethnicity. So to be Anglican is not to share a common English heritage, culture, or liturgy, nor is to look to the See of Canterbury as the source of Episcopal government. It would be wrong to assume that the Anglican Communion finds its identity through links with the Church of England. ● What do we mean by Anglican? ● What do we mean by the Anglican Communion? ● Where did those terms “Anglican” and “Anglican Communion” originate? ● How did the first Anglican churches outside these islands spring up? Initially, it may be said, Anglicanism of the English variety followed not only the colonial flag, but also trade and commerce, and the penal system. But it soon started to spread too due to the endeavours of the missionary societies, including the Society for the Promotion of Christian Knowledge (SPCK, 1698), the (United) Society for the Propagation of the Gospel (SPG, 1701; later USPG – Anglicans in World Mission, and now simply the United Society or Us), and the Church Mission(ary) Society (CMS, 1799). North America: The Eucharist was first celebrated according to Anglican rites in North America in present-day Canada at Frobisher Bay in 1578. In what is today the US, the first celebration of the Eucharist according to Anglican rites was at Jamestown in Virginia in 1607. Latin America: The roots of the Anglican Church in Latin America were being planted with the arrival of English colonists on the Miskita coast in Central America from 1740. Expatriate Anglican chaplaincies were established in 1810 in Brazil, where the church today is Portuguese-speaking. Europe: Soon there was also a diffuse and diverse Anglican presence on the European Continent. Anglican chaplaincies were established in ports in the Netherlands and other parts of Europe in the 17th century, and further afield as the Levant and East India Companies flourished. From the time William Laud was Archbishop of Canterbury in the 1630s, Anglicans abroad, in the colonies or in the centres of trade, were theoretically under the jurisdiction of the Bishops of London, not of the Archbishops of Canterbury. In the 17th century, there was an Anglican presence in such diverse places in Europe as the Dutch ports, including Amsterdam; in Zakynthos and Piraeus (both now in Greece but then part of the Venetian and Ottoman empires), where the presence of the Levant Company meant there were Anglican services and Anglican burials; and in Paris, where there was also a Nonjuror Anglican presence at the Jacobite court in exile, those serving it including the former Chancellor of Connor, the Irish theologian, Charles Leslie. With the foundation of SPCK in 1698 and SPG in 1701, both under the patronage of the bishops of both the Church of England and the Church of Ireland, a new missionary era opened up for Anglicans. In North America, the early SPG missionaries included Bishop George Berkeley, who went to Bermuda. In the 18th century, SPG and later CMS were active in missionary work in Canada. The first regular church services in Canada began in 1710 at Port Royal, and the first Anglican church built in present-day Canada was Saint Paul’s, Halifax, built in 1750. By now there was strong pressure for bishops to serve the church in the colonies. Anyone wanting to work as an Anglican priest in the colonies had to be ordained in England by the Bishop of London. Except in Scotland, where the penal laws enforced diocesan and episcopal reorganisation on the nonjuring Episcopal Church, a royal charter was needed to create new Anglican dioceses, and new bishops had to be consecrated under a royal mandate. Among those who were early advocates of providing bishops for the colonies in America was the Co Donegal missionary, Charles Inglis. The American Revolution meant the expulsion of many loyalist Anglicans, including Inglis, to neighbouring Canada. But it left Episcopalians in the new US without bishops. 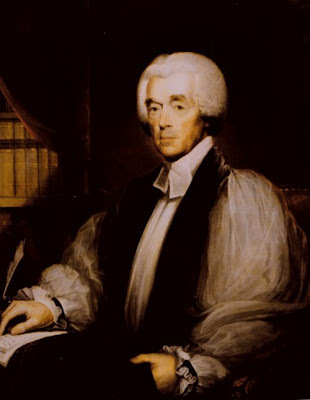 In 1783, the clergy of Connecticut elected Samuel Seabury (1729-1796) as their bishop and sent him to London for consecration. But legal constraints prohibited the bishops of the Church of England from consecrating him – there was no diocese created by royal charter, no royal mandate to consecrate him, and he could be regarded as either a foreigner or a traitor. Seabury turned to the nonjuring bishops of the Episcopal Church of Scotland, who consecrated him in 1784. He returned to America, promising to adapt the distinctive Scottish Communion in his office, and providing a line of episcopal succession that owes its origins not to the Church of England, but to Scotland. By now, the church in the US was being slowly organised, and the convention in Philadelphia in 1785 and the election of a presiding bishop in 1789 mark not, as Charles Long asserts, the formation of “the first Anglican Province independent of the Church of England,” but the formation of the first Anglican Province outside British jurisdiction. Eventually, in 1786, an act was passed allowing the Archbishop of Canterbury to consecrate bishops who were not crown subjects. In the following year, two more Americans were consecrated at Lambeth Palace. That year also saw the consecration of the Irish-born Charles Inglis as Bishop of Nova Scotia. An Act passed in 1819 allowed the ordination in the Church of England of clergy to serve outside the Church of England, provided they were going to minister in the colonies. The act speaks of them of being “ordained for the cure of souls in his Majesty’s foreign possessions.” An Act of 1841 allowed the Archbishops of Canterbury and York to consecrate bishops to work “in any foreign country” without requiring the oath of allegiance. So, what about Anglican expansion outside Europe and North America? In West Africa, Anglican mission work began on the Gold Coast (present-day Ghana) in 1752. South Africa: The oldest Anglican province in Africa is the Anglican Church of Southern Africa. Although Roman Catholic missionaries had arrived with the early Portuguese explorers, and the Dutch Reformed Church was present since the 17th century, the first Anglican presence in Cape Town is recorded in 1806. In India, SPCK worked in areas where there were British traders but no British colonies. There, unsure about the legal status of the Church of England clergy, SPCK initially employed Lutheran clergy from Denmark. In 1814, a bishop was consecrated for Calcutta, but his jurisdiction included most of Asia and much of Africa too, with Australia as an archdeaconry in his diocese. Australia: The Anglican Church came to Australia in 1788 with the “First Fleet,” primarily convicts and military personnel. Free settlers soon followed, and Australia received its first Anglican bishop in 1836. The Anglican Churches in south-east Asia date back to a chaplaincy formed in West Malaysia in 1805. Two Anglican bishops were consecrated for the West Indies in 1824. Anglicanism was spreading rapidly, in an unplanned and uncontrolled way, following commerce, colonialism, trade and the penal system, and the travels of explorers and adventurers. It was outside the grasp of the Archbishops of Canterbury and York, and outside the limitations of any legislation passed by parliament in Westminster. In 1841, the Colonial Bishoprics’ Fund was created, and speeded up the expansion of the colonial episcopate. The first bishop for Southern Africa was appointed in 1847, the first bishop for south-east Asia was consecrated in 1855. In many colonies, the Anglican churches were seeking or finding their own measure of autonomy: in 1844, Bishop George Augustus Selwyn of New Zealand called an informal synod; New Zealand was granted a measure of self-government in 1852, and in 1857 the Church of New Zealand received its own constitution. By 1864, Anglicanism had its first black African bishop with the consecration of Samuel Adjai Crowther (1806-1891) as Bishop for Nigeria. Three years later, in 1867, there were nearly 50 bishops in the British colonies, and 35 dioceses in the USA. Anglicanism was no longer a collection of churches offering to serve people from England, Wales, Scotland and Ireland. It was no longer even confined to areas under British rule. Even in the Church of England and the Church of Ireland, there were early questions too of who we were in communion with. In Ireland and in England at the end of the 17th century, our churches were happy to welcome the Huguenots. They were welcomed, found a place within the church, and allowed to continue their ministries, provided all future ordinations were carried out by bishops. ● the French Gallicans, including Piers de Girardin and Louis Ellies Dupin (1657-1719), who also had a vision of uniting the Orthodox and Western churches. The Nonjurors had a scheme for their form of Anglicanism to be recognised by the Patriarch of Jerusalem, seeing the Eastern Orthodox Church as natural partners for forming a wider church family. The first missionary endeavours beyond the colonial boundaries saw Anglicans in SPCK happy to employ Danish and German Lutherans, provided they used the liturgy of The Book of Common Prayer. In the early 19th century, Anglicans were happy to collaborate with the Lutherans in establishing a bishopric in Jerusalem. If the English language or some links with British sovereignty did not define “Anglicanism,” then adherence to The Book of Common Prayer or the 39 Articles did not provide that definition either. The Scottish liturgy, which was considerably “higher” than the 1662 Book of Common Prayer, influenced and shaped the liturgy of the Episcopal Church in the US (TEC); for a long time, the 39 Articles were not part of the tradition of the Scottish Episcopal Church until 1811, and when they were adopted by the Episcopal Church in the US, they were modified to delete all references to the English sovereign. The terms Anglican and Anglicanism derive etymologically from the Latin anglicanus, meaning English. It is a term that predates the Reformation and had mediaeval usage. So far, the earliest use of the term I can find is in Ireland, as early as 1172, almost half a century before it is used in England. In the 12th century, separate and various Irish Rites were being used liturgically throughout the island. But these were abolished, at the Synod of Cashel in 1172, when the Roman Rite juxta quod Anglicana observat Ecclesia, or the rite “as observed by the Anglican Church,” was finally substituted. In the 13th century, the Magna Carta in 1215, in both its English and Irish versions, refers to Anglicana ecclesia, the English Church. The same phrase is used again at the time of the Reformation – in 1534 in the act confirming the royal supremacy, and in 1562 in John Jewel’s defence of the English Reformation, Apologia Ecclesiae Anglicanae. In the 18th and 19th centuries, however, the term “Anglican” begins to refer more specifically to a distinct theological position. The Dublin-born political philosopher Edmund Burke refers to “Catholicks, Anglicans or Calvinists,” and the historian Thomas Babington Macaulay to Anglican doctrine. The French form anglicanisme occurs, it seems, for the first time in 1817, presumably by analogy with gallicanisme, and John Henry Newman uses the phrase “Anglicanism” from 1838 on. The term “Anglican Communion” is only first used in 1851, and eventually is used as a defining term at the first Lambeth Conference in 1867. The origins of that Anglican Communion as we have come to know it can be found in two legal battles and a doctrinal dispute that rocked the Anglican churches in the 1850s and 1860s. The first of these legal battles became known as the Eton College Case. In 1857, the courts ruled that the established Church of England could not exist in those colonies where there was a local legislature. Some years after his synod in Cape Town, Gray – by now accepted as Archbishop of Cape Town and Metropolitan – attempted to depose the Bishop of Natal, John Colenso, for heresy in 1863. Colenso appealed to the Privy Council in London, which ruled in March 1865 that Gray and his synod could only exercise authority over those who voluntarily accepted it. It also held that the letters patent issued to the bishop were invalid because the Cape Colony had its own legislature. By the time a judgment was issued, Gray had tried Colenso on the grounds that Colenso had sworn canonical obedience to him as metropolitan, thus voluntarily accepting his jurisdiction. The rulings from Gray and the Privy Council left a complete mess. The letters patent were invalid, bishops had been appointed by patents issued in London and yet there was no established church for them to serve in because the colony had its own legislature. Some English bishops doubted the wisdom or even the legality of calling such a conference. But the idea was supported at a meeting of the Lower House of the Convocation of Canterbury in May 1866. But Longley conferred with other bishops beyond the boundaries of the Church of England and the Church of Ireland, beyond the colonial boundaries too: among those he consulted was the American Episcopalian Bishop of Illinois, Henry John Whitehouse (1803-1874). It was clear, as the invitations were being sent out, that the proposed meeting could neither enact canons nor make any decision that was binding on the Church. Nevertheless, the invitations went out to “the bishops in visible communion with the United Church of England and Ireland” to a meeting under the Presidency of the Archbishop of Canterbury in Lambeth Palace. The invitations were sent to 150 bishops: 67 attended, although the Archbishop of York, petulant if not hostile from the first refused. The Anglican Church of Burundi; the Church of the Province of Central Africa; Province de l’Eglise Anglicane du Congo; the Anglican Church of Kenya; the Church of Nigeria (Anglican Communion); l’Eglise Episcopal au Rwanda; the Anglican Church of Southern Africa; the Episcopal Church of the Sudan; the Anglican Church of Tanzania; the Church of the Province of Uganda; the Church of the Province of West Africa. The Episcopal Church in Jerusalem and the Middle East. The Church of Bangladesh; Hong Kong Sheng Kung Hui; the Church of the Province of the Indian Ocean; the Nippon Sei Ko Kai (the Anglican Communion in Japan); the Anglican Church of Korea; the Church of the Province of Myanmar (Burma); the Church of North India (United); the Church of Pakistan (United); the Episcopal Church in the Philippines; the Church of the Province of South-East Asia; the Church of South India (United); the Church of Ceylon (Sri Lanka; Extra-Provincial to the Archbishop of Canterbury). The Anglican Church in Aotearoa, New Zealand and Polynesia; the Anglican Church of Australia; the Church of the Province of Melanesia; the Anglican Church of Papua New Guinea. Igreja Episcopal Anglicana do Brasil; Iglesia Anglicana de la Region Central de America; la Iglesia Anglicana de Mexico; Iglesia Anglicana del Cono Sur de America; the Church in the Province of the West Indies; Iglesia Episcopal de Cuba; Bermuda (E-P to Canterbury); Falkland Islands (E-P to Canterbury). The Anglican Church of Canada; The Episcopal Church (TEC, formerly ECUSA). In addition, the Anglican Church of North America is demanding recognition within the Anglican Communion. 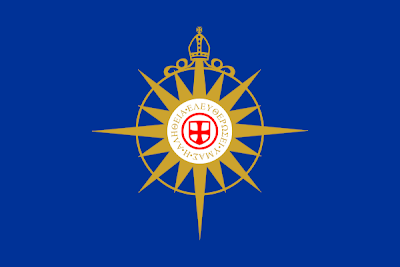 The Church of England; the Church of Ireland; the Scottish Episcopal Church; the Church in Wales; the Lusitanian Church (E-P to Canterbury); the Reformed Episcopal Church of Spain (E-P to Canterbury). M. Chapman (ed), The Anglican Covenant (London: Mowbray, 2008). M.D. Chapman, The Hope of Things to Come, Anglicanism and the Future (London: Mowbray, 2010). MD Chapman, Anglican Theology (London: T&T Clark, 2012). D. Dormor et al (eds. ), Anglicanism: The answer to modernism (London: Continuum, 2003). Samuel Wells, What Anglicans Believe, An Introduction (Norwich: Canterbury, 2011). (Revd Canon Professor) Patrick Comerford is Lecturer in Anglicanism, Liturgy and Church History, the Church of Ireland Theological Institute. These notes were prepared for a lecture at the Reader Course Day Conference on 10 October 2015. ● The readings in the Revised Common Lectionary, not for the following Sunday, but the Sunday after, so that any of us who are preaching have opportunities to reflect on the readings before beginning to write a sermon. ● The Johannine readings, including Saint John’s Gospel, the Johannine Letters, and the Book of Revelation, in various combinations. ● The Pastoral Letters, which are appropriate studies in ministry. ● Heroes of the Bible and heroes of the faith. The choice is yours, but while you think about this, I have prepared a short study for this morning [10 October 2015]. Job 38: 1-7; Psalm 104: 1-10, 26, 37c; Hebrews 5: 1-10; Mark 10: 35-45. The Gospel reading (Mark 10: 35-45) is probably the Gospel reading you also hear at your ordination as deacons, and so it is an appropriate Gospel reading for our first Bible study together in this tutorial group this morning. 35 Καὶ προσπορεύονται αὐτῷ Ἰάκωβος καὶ Ἰωάννης οἱ υἱοὶ Ζεβεδαίου λέγοντες αὐτῷ, Διδάσκαλε, θέλομεν ἵνα ὃ ἐὰν αἰτήσωμέν σε ποιήσῃς ἡμῖν. 36 ὁ δὲ εἶπεν αὐτοῖς, Τί θέλετέ [με] ποιήσω ὑμῖν; 37 οἱ δὲ εἶπαν αὐτῷ, Δὸς ἡμῖν ἵνα εἷς σου ἐκ δεξιῶν καὶ εἷς ἐξ ἀριστερῶν καθίσωμεν ἐν τῇ δόξῃ σου. 38 ὁ δὲ Ἰησοῦς εἶπεν αὐτοῖς, Οὐκ οἴδατε τί αἰτεῖσθε. δύνασθε πιεῖν τὸ ποτήριον ὃ ἐγὼ πίνω, ἢ τὸ βάπτισμα ὃ ἐγὼ βαπτίζομαι βαπτισθῆναι; 39 οἱ δὲ εἶπαν αὐτῷ, Δυνάμεθα. ὁ δὲ Ἰησοῦς εἶπεν αὐτοῖς, Τὸ ποτήριον ὃ ἐγὼ πίνω πίεσθε καὶ τὸ βάπτισμα ὃ ἐγὼ βαπτίζομαι βαπτισθήσεσθε, 40 τὸ δὲ καθίσαι ἐκ δεξιῶν μου ἢ ἐξ εὐωνύμων οὐκ ἔστιν ἐμὸν δοῦναι, ἀλλ' οἷς ἡτοίμασται. 41 Καὶ ἀκούσαντες οἱ δέκα ἤρξαντο ἀγανακτεῖν περὶ Ἰακώβου καὶ Ἰωάννου. 42 καὶ προσκαλεσάμενος αὐτοὺς ὁ Ἰησοῦς λέγει αὐτοῖς, Οἴδατε ὅτι οἱ δοκοῦντες ἄρχειν τῶν ἐθνῶν κατακυριεύουσιν αὐτῶν καὶ οἱ μεγάλοι αὐτῶν κατεξουσιάζουσιν αὐτῶν. 43 οὐχ οὕτως δέ ἐστιν ἐν ὑμῖν: ἀλλ' ὃς ἂν θέλῃ μέγας γενέσθαι ἐν ὑμῖν, ἔσται ὑμῶν διάκονος, 44 καὶ ὃς ἂν θέλῃ ἐν ὑμῖν εἶναι πρῶτος, ἔσται πάντων δοῦλος: 45 καὶ γὰρ ὁ υἱὸς τοῦ ἀνθρώπου οὐκ ἦλθεν διακονηθῆναι ἀλλὰ διακονῆσαι καὶ δοῦναι τὴν ψυχὴν αὐτοῦ λύτρον ἀντὶ πολλῶν. Whenever I read this Gospel story (Mark 10: 35-45), I think back to my childhood days. I remember all those preparations for football matches, as we lined up to pick sides. And how we all wanted to be among the first to be picked for a team. And then when we were picked how we wanted the glory. Slow at passing the ball, in case I might not score the goal. Better to lose that ball in a tackle than to pass it to someone else and risk someone else scoring the winning goal. And that’s who James and John remind me of: wanting to be picked first, wanting to be the first to line up beside the team captain, being glory seekers rather than team players. No wonder the other ten were upset when they heard this. But they were upset, not because they wanted to take on the servant model of priesthood and ministry. They were upset not because James and John hadn’t yet grasped the point of it all. They were upset because they might have been counted out, because they might have missed out being on the first team, on the first XI. And their upset actually turns to anger. Not the sort of candidates you would like to meet at a selection conference. And what did James and John want in reality? When we say that Christ “is seated at the right hand of the Father,” we mean that Christ is the Word of God. 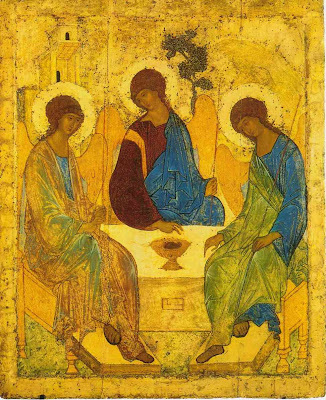 In some way, I suppose, this is what Andrei Rublev was trying to convey in his icon of the Visitation of Abraham, his icon of the Holy Trinity in the Old Testament, which we are looking at as an aid in the Bible Studies in the seminar on liturgy with full-time MTh students on Monday morning [12 October 2015]. In that icon, the Father and the Spirit are seated to the right and left of the Son. Indeed, in that icon, Christ is wearing not the elaborate high-priestly stole of a bishop, but the simple stole of a deacon at the table. For James and John to want to be seated at the right and left of Christ in his glory – not when they were sitting down to a snack, or travelling on the bus, or even at the Last Supper, but in his glory (see verse 37) – they were was expressing an ambition to take the place of, to replace God. But to be like God means to take on Christ’s humility, as we are reminded in the reading from the Letter to the Hebrews. We are made in the image and likeness of God, and then God asks us, invites us to return to that image and likeness when Christ comes in our image and likeness – not as a Byzantine emperor or Roman tyrant, but just as one of us. Wanting to be first, wanting to be noticed by those with power and privilege, is not a model for diaconal ministry. At present, we see deacons as serving in a one-year transitional ministry, on the pathway to priesthood, perhaps even eventually to the episcopate. And it is good that those who serve the Church as bishops and priests are reminded on days like this that they were first ordained as deacons and that they remain deacons … that the diaconal ministry, the ministry of service, is at the heart of the ministry of the Church. In his epistles, a word that Saint Paul uses for ministry is διακονία, the ministry of the διάκονος, the one who serves like those who wait on tables, the ministry of those who help meet the needs of and remind us of those who are neglected and needy by either collecting or distributing charity and making sure they are fed. You may be wearied of being reminded by me that the word liturgy (Λειτουργία) is the work for and of the people. But in its truest sense this is not the work of nice people, good people, people like us, but in its crudest use in Greek the work of the many, the service of riff-raff, even the beggars. In other words, the liturgy of the Church only becomes a true service when we also serve the oppressed, when we become God’s ears that hear the cry of the poor, and act on that, when through the Church Christ hears that cry of the bruised and broken. Deacons are to encourage us all, archbishops, bishops, priests, laity, to take stock again. We are challenged by diaconal ministry to move from merely acting out the liturgy to making the church a sacrament, a taste, a sign, a token of the promise of, a thirsting for the Kingdom of God. To be a great Church we must be a Servant Church, a deacon Church, “For the Son of Man came not to be served but to serve, and to give his life as a ransom for [the] many” (Mark 10: 45). The foundation of all ordained ministry is our diaconate. We are called first and foremost to serve. And when we serve the people, when in obedience we meet them in their suffering, then we can hear their cries and their prayers and truly serve them in the services of the Church and in the Divine Liturgy (see Hebrews 5: 1-10). It was in humbling himself as a servant that Christ truly became the role model for all deacons, priests and bishops. Are we willing to be like Christ in our ministry? Of course James and John were. See how this hot-headed pair, the sons of Zebedee, went on to serve the community of the baptised and the community that shared in the one bread and the one cup, the community that is the Church, the community that in baptism and in the shared meal is the Body of Christ. James – not James the Brother of the Lord, whom we remember on the following Friday (23 October 2015), but James the Great – was executed by the sword and became one of the first Christian martyrs (see Acts 12: 1-12). John too lived a life of service to the Church: he was exiled on Patmos, and although he died in old age in Ephesus, there were numerous attempts to make him a martyr. And, of course, he gave his name to in the Johannine writings in the New Testament. Martyrdom comes in many forms. In essence the word means witness. But the first step in martyrdom is dying to self, to self-ambition, to self-seeking, to self-serving. Your life must be a life that is testimony to your most cherished beliefs, testimony to Christ himself. We love our titles in Anglicanism – canon, archdeacon, prebendary, dean – and we can all too easily stand firmly on our dignity, and even on our dignitaries if they get in our way. But you are not entering a career with good prospects. There is nothing wrong with any one of you wanting to be a bishop. There is something wrong if you are here seeing that as a career goal. “For the Son of Man came not to be served but to serve, and to give his life a ransom for many” (Mark 10: 45). Note: 18 October is also the Feast of Saint Luke the Evangelist. The RCL readings for that day, if chosen, are: Isaiah 35: 3-6 or Acts 16: 6-12a; Psalm 147: 1-7; II Timothy 4: 5-17; Luke 10: 1-9. (Revd Canon Professor) Patrick Comerford is lecturer in Anglicanism, Liturgy and Church History, the Church of Ireland Theological Institute. This introduction to a Bible study was prepared for a tutorial group with part-time MTh students on 10 October 2015.